heute zeige ich euch meine neuste Karte für die aktuelle Challenge bei „Marvelous Magnolia challenge„. Dort lautet das Thema Band oder Schnur. Ich habe beides auf meiner Karte verwendet und meine neue Pilz Stanze eingeweiht. today I show you my new work vor „Marvelous Magnolia challenge„. The theme is ribbon or twin. I´ve used both and my new mushroom die. Danke für euren Besuch und habt einen tollen Tag. / Thanks for coming and have a nice day. Sweet card! Thanks for joining us at CC&CC! Die ist ja schnuckelig! Eigentlich für jeden Anlass geeignet. Toll! A great card Nadell, something about toadstools that pleases. Many thanks for joining in our stamping theme at Allsorts challenge this week. Danke Dir fürs Mitmachen bei Hanna and Friends. Lovely scene, great colouring too. Thanks for sharing with us at Lovely-haenglar-only challenge. Me again, lovely scene,Thanks for sharing with us at Totally Tilda Challenge. 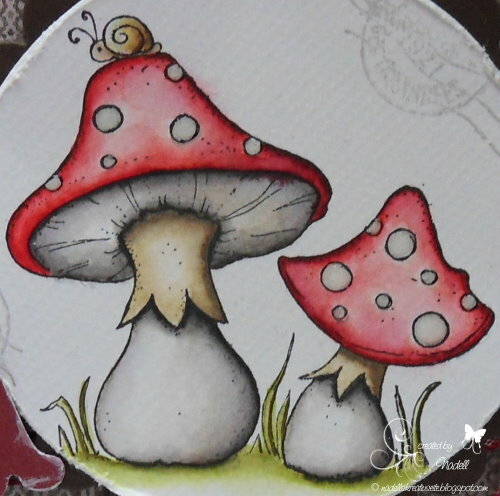 Awwww…how cute are these mushrooms! So sweet also how you've combined with the die. Thanks for joining LLC for our "In the Garden" challenge. I am hopping for marvelous Magnolia. I can't find your card but this card is also beautiful. Nadja, son preciosos tus trabajos!